Emerald City Smoothie franchise business opportunity. 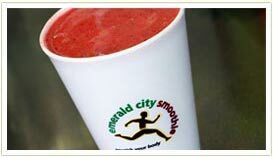 Free Emerald City Smoothie Pizza business franchise information. If you are looking for a significant franchise opportunity with a low cost of entry and a high upside potential, you may be a great candidate to be an Emerald City Smoothie (ECS) franchise owner. One of the most important things that set ECS apart from the crowd is its unique brand promise. ECS delivers healthy smoothies with unbeatable taste. When you're getting started, this unique concept results in a shorter time to break even. Even better, over the long run, it means that you own a defensible brand that is very difficult to copy. We've also built our uniqueness beyond the product. ECS also features all the benefits offered by franchises in general including a formula for operating a successful business that all but eliminates business mistakes commonly made by new business owners. Today, one out of every three dollars spent by Americans for goods and services is spent in a franchised business (source: Franchise.org website), generating an estimated $1 trillion in the U.S. economy annually. The combination of the franchisor's expertise and your hard work create the potential for a strong business. With a franchise, you are in business for yourself, not by yourself! Emerald City Smoothie is a retail concept that marries taste and good health. At the center of the ECS value proposition is an incredible tasting, 24-ounce smoothie. The best description of our smoothies is that they taste fresh, like just-picked fruit off the tree. Once you try one, it's almost impossible to not come back for more. A recent study, the ECS Customer Study 2005, by integrated brand experts Parker LePla, supports our claims. Finally, ECS scored an average 4.29 on Parker LePla's brand strength on a scale ranging from -5 to +5. A 4.29 places these customers in the Committed level, which is characterized by extreme loyalty, a willingness to pay more than for a competitive product and a desire to tell others about the brand. This customer behavior makes ECS a strong brand. In addition, the smoothie industry as a whole benefits from America's long-term need to embrace a healthier lifestyle and combat obesity. Our customers appreciate taste and health. To learn more about the Emerald City Smoothie food franchise opportunity, simply complete the form below.